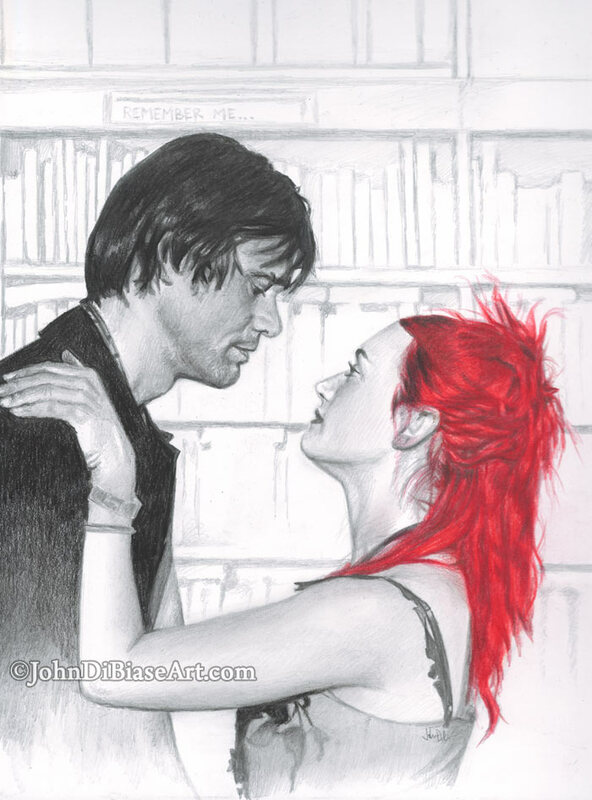 In the middle of working on other projects, while watching my Clean Films edit of “Eternal Sunshine of the Spotless Mind,” I felt inspired to work on a new piece with Joel and Clem. (I actually did one for Amy around 2006 – i think it was even like 16 x 20, one of my biggest portraits). I aimed to do a quick-style sketch. I started it while watching the movie, then finished it the next night. I wanted to do their faces pretty detailed and then just lightly sketch in the bookstore backdrop. I love that this is Joel’s memory version of Clem and how she tells him to remember her just before she vanishes. I decided to fade them both out as if the whole image is threatening to disappear at any moment. It’s all graphite except for colored pencil for her hair.